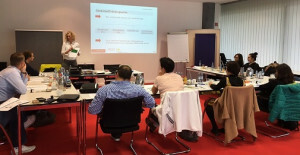 The demand for the basic course ‘Textile Merchandising Knowledge’ with Birgit Jussen continues. Therefore, the Akademie für Textilveredlung will offer the seminary already for the fifth time on March 3th 2018. Together with the academy partner Stickdeinlogo.de, the event will take place in Overath near Cologne and is aimed for textile printers, embroiderers and promotional specialists. The PSI Institute will be again the cooperation partner. The lecturer will explain the textile production chain and will impart the most important basics about fibres, fabrics and finishing.